(Nanowerk Spotlight) Research in nanofluidics energy conversion is enlightened by the electrogenic cells that convert transmembrane ion-concentration gradients into the release of electrical impulses by membrane-protein-regulated ion transport through the hierarchically arranged ion channels and ion pumps. One particular example is electric eels (Electrophorus electricus), which are capable of generating electric shocks up to 600 V for predation and self-defense. One nanotechnology example we reported on before is a graphene coating wrapped around a sensor, which will act as a 'smart skin' that serves as a nanofluidic power generator. One research direction in this area is to build synthetic nanofluidic devices with a minimum set of components, yet can mimic the biological energy-conversion process on the nanoscale (PNAS, "Approaches for biological and biomimetic energy conversion"). Another research direction is the multiscale integration of individual nanofluidic devices into macroscopic materials for practical use ("Two-dimensional ion channel based soft-matter piezoelectricity"). 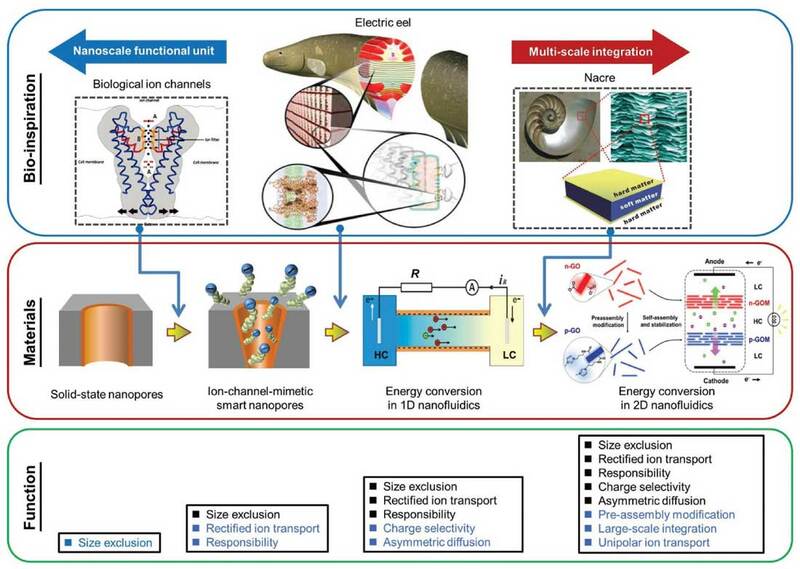 So far, bio-inspired energy conversion in solid-state nanofluidic devices has experienced three generations of evolution with the uptake of separate inspirations from biological ion channels, electric eels, and nacre. In the past decade, significant progress has been made in both fundamental and application aspects. 2D-material-based nanofluidic devices are the current development directions, yet this field is still in its infancy. There is large room to further improve the quality and functions of the membrane materials. A new review article in Advanced Materials ("Bio-inspired Energy Conversion in Nanofluidics: A Paradigm of Material Evolution") presents an overview of the structural and functional evolution in synthetic one-dimensional (1D) and two-dimensional (2D) nanofluidic systems under the guidance of three different types of biological inspiration: the asymmetric ion-transport behaviors of biological ion channels, the strong bioelectric function of electric eels, and the layered microstructure of nacre. In their review, the authors highlight progress, challenges, and future perspectives in this growing field. Compared with protein-based biological pores, solid-state nanopores show great advantages in high stability, controlled geometry and surface chemistry, and ease of integration with other devices or the building of nanopore arrays. Researchers have proposed various routes to fabricate 1D solid-state nanopores, such as chemical etching of latent ion tracks in polymer film, anodic oxidation of aluminum membranes, electron- or ion-beam lithography in silicon-based ultrathin membranes, and electrochemical etching of glass nanopipettes, etc. At this stage, solid-state nanopores merely have the function of size exclusion and simple surface-charge regulation, which are used for molecular sensing and separation, particularly for DNA sequencing. Inspired by the bioelectric functions of the electrocyte cells of the electric eel, asymmetric nanopores find new applications in electrokinetic energy conversion (see figure above). In surface-charged nanofluidic channels, the counter-ions are preferentially transported over the co-ions, known as ion selectivity. Based on this mechanism, there are generally two ways of electrokinetic energy conversion in artificial nanofluidic systems: the hydraulic and osmotic energy conversion. Toward practical applications, one immediate challenge is to integrate individual nanoscale ionic conductors into macroscopic membrane materials in a facile and cost-efficient way. To address this challenge, bioinspiration from the microstructure of nacre, which consists of alternatively arranged hard inorganic layers (aragonite platelets) as a backbone and soft organic layers (polysaccharides and proteins) as a glue, leads the material design and large-scale integration of artificial nanofluidic devices to a completely new stage, termed 2D nanofluidics. Via the exfoliation-reconstruction strategy, the 2D nano-building-blocks, such as graphene and its derivatives, can be reassembled into a layered configuration. The interstitial space between reconstructed 2D materials can be generally considered as lamellar nanochannels, which allows the transport of molecular cargoes and ionic species. Currently, graphene oxide and chemically converted graphene have become the most appealing building blocks for the construction of nacre-mimetic materials. Different from 1D nanofluidic systems, mass and charge transport in lamellar nanochannels is confined only in the direction normal to the channel wall. The layered configuration largely reduces the fluidic resistance and increases the packing density, while keeping the surface-governed properties in the nanoconfined dimension. The nacre-inspired 2D layered membrane provides a solution for the large-scale integration of individual nanofluidic channels into macroscopic materials for practical use. Besides hydrophobic chemically converted graphene, hydrophilic graphene oxide nanosheets have also been used for the construction of high-performance nanofluidic power sources. In one very smart approach, researchers demonstrated a 2D nanofluidic osmotic energy-conversion device by polyelectrolyte-functionalized graphene oxide membrane (Chemical Science, "Energy harvesting from enzymatic biowaste reaction through polyelectrolyte functionalized 2D nanofluidic channels"). In their design, human urine was used as the energy source and the converted chemical gradient stems from an enzymatic reaction. The preferential transport of cationic ions (NH4+), generated by the urease catalysis, through the poly(acrylic acid)-functionalized GO nanochannels converts chemical energy from the enzymatic reaction of biowaste into electricity. "From a technical view, mass production of high-quality 2D nanofluidic materials still meets challenges," the authors conclude their review. "Emerging techniques, such as wet-spinning assembly and printing techniques, are promising to achieve this goal. However, what is the next step of evolution? The continuous uptake of new bioinspirations from, for example, the ultralubricated biointerface and the multiphase flow in plant stems, is expected as the next-generation of material evolution and makes the field of bio-inspired nanomaterials ever full of vitality."